This campaign was created to promote IKEA’s refresh and redecorate range, which helps people achieve the look they want for their home with simple, quick, affordable changes. The objective for the campaign was to demonstrate that is it easy and affordable to make your home feel fresh and rejuvenated. We wanted to inspire them with what is possible. 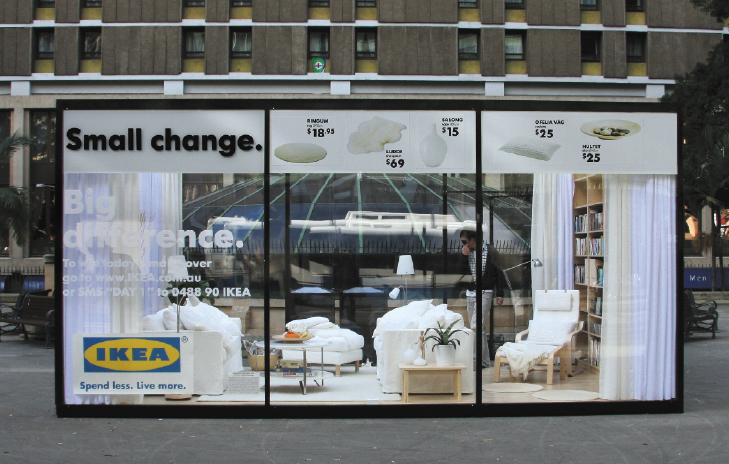 Putting this through the filter of demonstrating that IKEA understands real life at home the campaign proposition developed was – Change a lot for a little. The creative idea was Small Change, Big Difference. The idea that you don’t have to do or spend a lot to make a big difference to the way your home looks and feels. This idea was manifested in an integrated campaign. •	EXPERIENCE THE DIFFERENCE: a live installation in Sydney, Perth and Brisbane that changed daily to show how new cushions, lighting, blankets and rugs can completely transform a room, even when the furniture remained the same. The change was shown each day at the campaign microsite. •	WIN THE DIFFERENCE: A competition which could be entered via SMS or at the campaign site enabling people to win the makeover each day, with the entire room contents available at the end of each week in each state.